"Book News," Number 285, May 1906, pg. 607. From RG 414, Henry van Dyke. On May 22, 1906, the Reverend Dr. Henry van Dyke (1852–1933), Princeton professor, prolific author, and past moderator of the General Assembly (1902), stood before the PCUSA General Assembly in Des Moines, Iowa , to present the final report of the Special Committee on Forms and Services and the printed results of the committee’s work: The Book of Common Worship. While van Dyke himself was popular—according to one press account, he was greeted with “thunderous” applause—the proposed new service book was not. Prior to the assembly, the book was attacked in the church press and twenty overtures asked that the book not be released or the project killed entirely. The little book that kicked up such a fuss was hardly the first volume of liturgical forms published for American Presbyterians. Books such as A. A. Hodge ’s A Manual of Forms (1877) and Herrick Johnson ’s Forms for Special Occasions (1889) had been commercially available for decades. Such manuals were designed to provide ministers with guidance on how to conduct the sacraments and “occasional” services—ordinations, weddings, and funerals—that did not occur in weekly worship. Nor was it controversial that some sort of guidance was needed. These services were important church occasions when theological integrity and denominational uniformity might be expected, yet the church’s Directory for Worship, which had not been revised since its adoption in 1789, provided only vague guidance or—in the case of ordination—no guidance at all. How to fill the void? 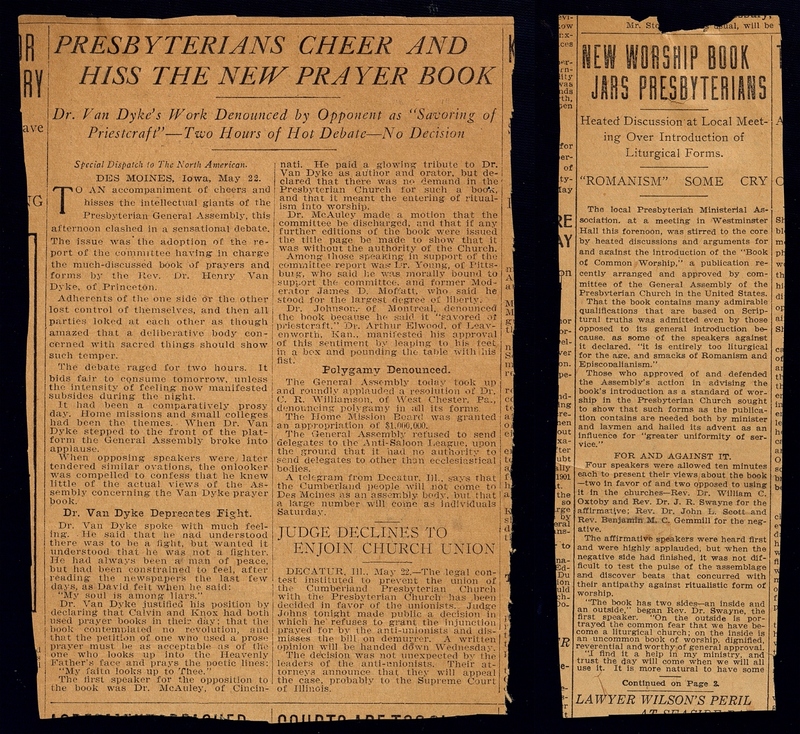 For many, the solution was for the General Assembly to provide the church with published worship resources, but Presbyterians have had a long and troubled history with prayer books. Presbyterian worship has always been characterized by congregational freedom practiced within broadly defined norms. Calvinist churches of the Reformation had detailed liturgies (John Knox’s liturgy was used in Scotland for several generations), but these fell into disuse as the Protestant movement matured. Liturgies came to be regarded as crutches that had outlived their usefulness. Church leaders assumed that a community rightly instructed in the Reformed faith could worship the Lord freely in spirit and in truth with very little structure. To rely upon fixed forms—even the regular use of the Lord’s Prayer, the Ten Commandments, and the Apostles’ Creed—came to be viewed as a dangerous drift back to the rote prayers and ritualism of an unreformed church. American Presbyterians shared many of these values and, after lightly revising the Puritan-inspired Westminster Directory for Public Worship  (1645) for American use, placed it in the PCUSA constitution, initiating more than a century of official neglect of their corporate worship. By the mid-nineteenth century, critics even within the church declared that, compared to most Christian worship, Presbyterian worship was disordered, colorless, drab, pedantic, lacking in devotion, and far too dominated by the clergy. As the decades passed, there were repeated calls for change, and several attempts at reform. In that spirit, the 1902 and 1903 General Assemblies were overtured to provide the church with a handbook that gave ministers and elders more guidance on how to administer the sacraments and conduct occasional services. 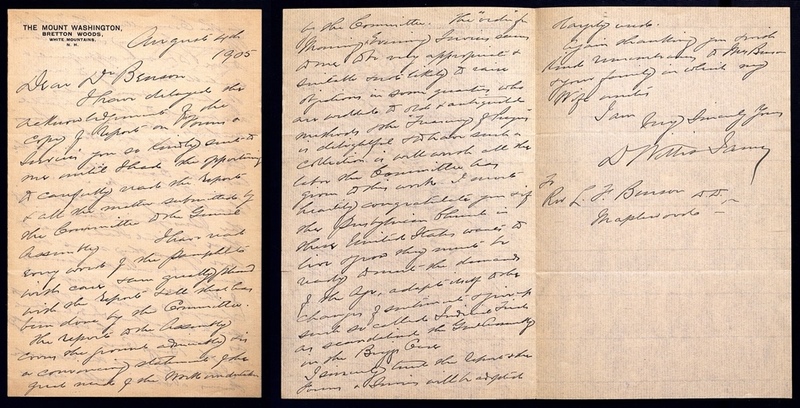 The 1903 General Assembly responded by establishing a special committee to draft “a book of simple forms and services, proper and helpful of voluntary use, in the celebration of the sacraments, in marriages and funerals, and in the conduct of public worship.” Persons who liked the prevailing freedom in worship, and suspicious of any “official” Presbyterian prayer book, could not have been reassured when the committee was announced. The ten members were distinguished but hardly representative of the church at large. Of the five ministers, four were academics, and all lived within a short train ride of New York. Of the five ruling elders (church officers who were not ministers), all were wealthy professionals and the only one not from New York or Philadelphia was from Chicago. Most significantly, the two most influential members of the committee, Henry van Dyke (named chairman) and Philadelphia’s Louis FitzGerald Benson (1855–1930), were well-known critics of current practice. The committee gathered at Avalon , van Dyke’s gracious home in Princeton, in the autumn of 1903. Van Dyke undertook to draft an order for Sunday morning worship, along with the sacraments. Benson would contribute a selection of psalms edited for use in worship and a “treasury” of historical prayers taken from Christian tradition. The third co-editor, Dr. Charles Hall, of Union Seminary, New York, would draft the occasional services, including weddings and funerals. Van Dyke, as general editor, would harmonize the contributions for consistency in vocabulary, tone, and style. 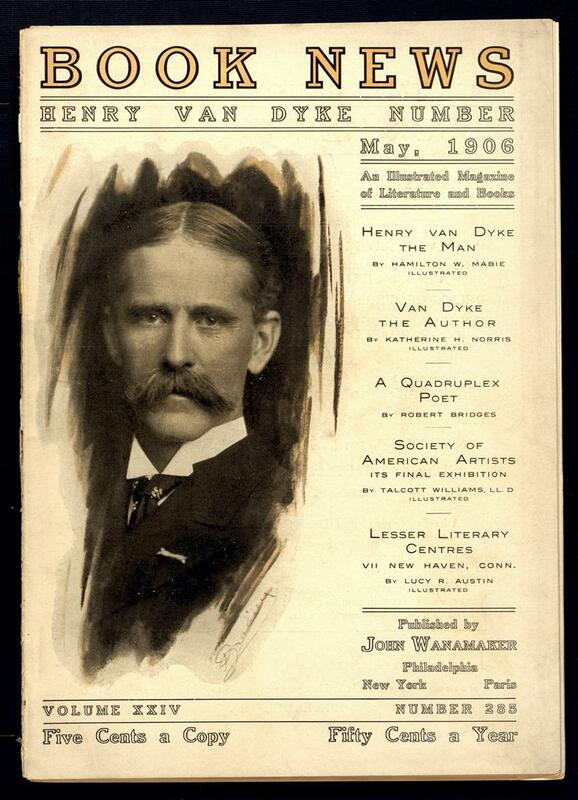 Ultimately, Benson and van Dyke, long-time friends and collaborators, did most of the tedious editorial work. The committee resolved to survey contemporary Presbyterian worship practices on a national scale, using the resources of the Office of the Stated Clerk to distribute a short questionnaire in the spring of 1904. Out of over 8,000 Presbyterian churches, more than 1,800 replied—a rich sampling, but still only a 22% return rate. Additionally, almost three quarters of the churches that did reply (1,302) came from only five states: New York, New Jersey, Pennsylvania, Ohio, and Illinois. The vast majority of respondents indicated that they currently used fixed forms such as the Lord’s Prayer, the Ten Commandments, and the Apostles’ Creed in worship (70%), and an even larger majority (80%) would welcome a distinctly Presbyterian book of forms. The committee believed it had found its mandate. Van Dyke summarized the working method of the committee, along with selected highlights of the national survey, to the 1904 General Assembly and offered a draft order of worship for the Lord’s Day and an order for the baptism of infants as a sampler. The assembly adopted the report and continued the committee for another year. In autumn 1904, the committee began drafting the occasional services for which the church had asked, with sample prayers and psalms, hoping to finish their work before the 1905 General Assembly in May. But in a classic case of “mission creep” the project kept expanding. In addition to an order for the Lord’s Day, the sacraments, and weddings and funerals, the committee included an order for evening worship, worship without a minister, confirmation, the licensing of a candidate, the ordination of a minister, ruling elder, and deacon, plus an order for the laying of a church cornerstone, and the dedication of a church. Nor were Benson’s supporting materials immune. His original treasury of prayers for public worship expanded to include a wide assortment of occasional prayers, private prayers, family devotional prayers, and table graces. The original two-dozen psalms edited for use in worship grew to 59 selections in the final edition. The committee took pains to emphasize the distinctively Reformed theology of the liturgies before them: if there is to be a confession of sin, it must be corporate; and there should be no priestly absolution, but a Scriptural assurance of forgiveness. Even the rubrics were edited to emphasize the authority of Scripture and the non-priestly role of the minister. 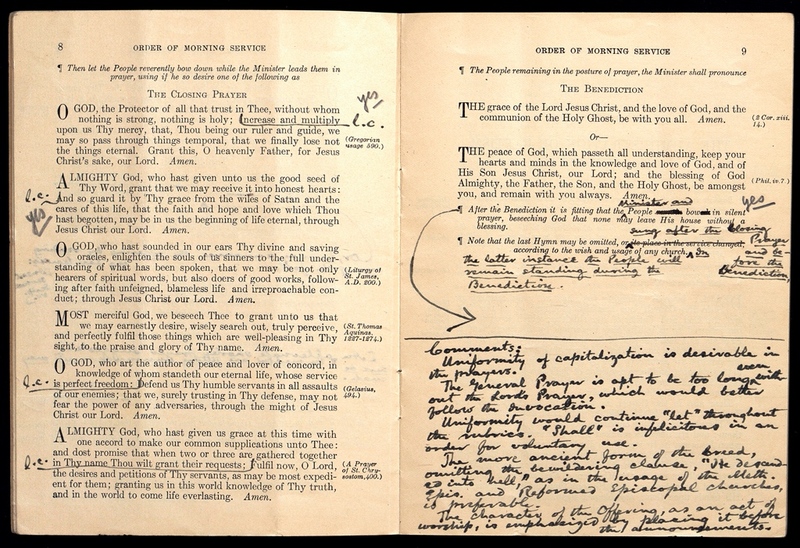 To fend off suspicion that non-Reformed theology was being imported into Presbyterian worship, the committee proposed noting the source of each text in the margins. The committee closely scrutinized the orders for the sacraments. Having grasped the little finger of worship, the committee was now forced to take hold of the whole hand of theology. In drafting orders for the Lord’s Supper and Baptism, they needed to ask: What was the Reformed doctrine of the Sacraments? And how does the church understand ordination? Confirmation? Matrimony? Death? Happily, several of the leading experts on these questions were members of the committee. For many issues they also looked to the Reformation liturgies of Bucer , Calvin, and Knox, or to choices being made by their Scottish contemporaries. From RG 414, Henry van Dyke. The minutes of the committee show that the book was not, as the press liked to call it, “van Dyke’s prayer book.” It was the joint effort of several strong-willed experts. In any number of places, the committee deleted van Dyke’s text where his personal predilections were most pronounced. The final text contains far fewer imperatives and many more invitations. It is less pedagogical and more practical. There are only two litanies or responsive readings that would require a congregation to possess multiple copies. Despite van Dyke’s persistent desire to include the fourth century hymn Te Deum  in a worship service, it was repeatedly cut, and finally relegated to the end of the treasury of prayers. Most significantly, the book in its final redaction was intended for the use of worship leaders and not, as van Dyke wished, for the routine use of worship participants. A draft of the entire book was typeset and presented in paperback to the 1905 General Assembly in Win ona Lake, Indiana . Van Dyke again presented the committee’s report, which simply reprinted most of the non-controversial 1904 report with a two-page addendum on the nature of the sacraments. This time, the debate was long and passionate, lasting more than two-and-a-half hours in the morning and continuing into the afternoon. Many asked for the book to be completed and approved; just as many doubted the wisdom of the whole project and warned of creeping ritualism. 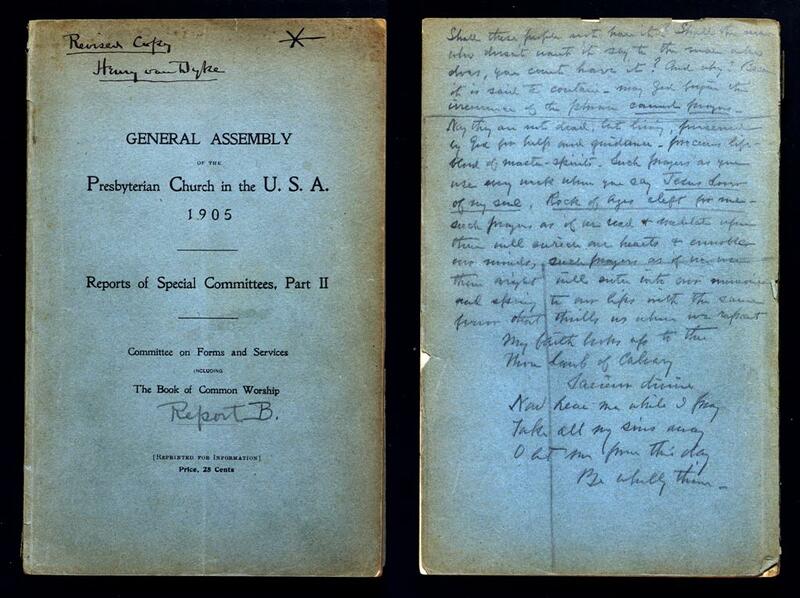 General Assembly Reports of Special Committees, Part B, 1905, with van Dyke's speech notes on back. From RG 65, folder 5. 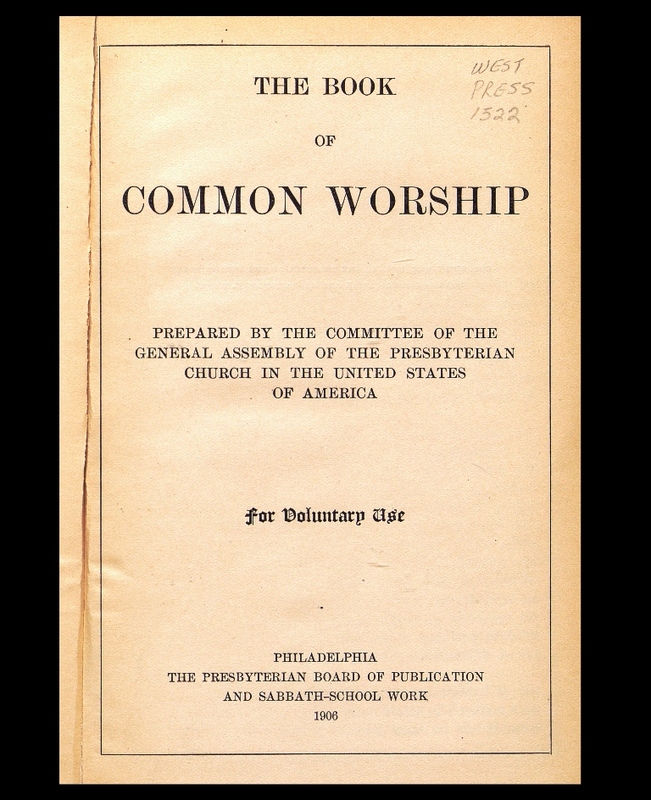 Despite the committee’s desire that The Book of Common Worship might help unify the Presbyterian Church, the prolonged floor debate at the 1905 General Assembly must surely have warned them that opposition to the project was real and developing strength. Van Dyke was later told that a band of influential Midwestern ministers and elders, having seen the 1905 paperback draft, decided over the summer to circulate overtures requesting that the 1906 General Assembly reject the book and dismiss the committee. Van Dyke’s friends in various presbyteries wrote to him that fall and winter, alerting him to the overtures, some of which were being adopted with surprising ease. In January 1906, van Dyke wrote Benson that the editor of Cincinnati’s Herald and Presbyter, Meade C. Williams, was “crusading against the book.” That publication was not alone. The Stated Clerk of the General Assembly, an ex officio member of the Special Committee, started a clipping file in Philadelphia to keep track of the controversy and to keep van Dyke informed. Historically, opponents of the prayer book have been caricatured as sectarian, anti-ritualistic, anti-Catholic, and reactionary. But based on a review of representative  pamphlets and articles held at the Presbyterian Historical Society , most opponents seem to have been motivated by a sincere belief that the genius of Presbyterian worship was its spontaneity and responsiveness to the moment. This was Spirit-lead “simplicity” as contrasted with the wearisome complexity of rote ritual. While most would grant that the mere existence of a Presbyterian prayer book posed no immediate threat, their understanding of church history made them fear that giving a prayer book a place in the church would lead eventually to the triumph of cold formalism. In addition to theological objections, there were legal and constitutional objections to the direction taken by the Special Committee. A May 16, 1906, editorial in the Herald and Presbyter complained that the “prayer book” the committee produced was not the book of forms for which the 1903 General Assembly had asked. The church wanted simple forms for occasional services, not fully developed orders for every conceivable occasion of worship, plus a psalter and a treasury of prayers. The committee had greatly exceeded its mandate. 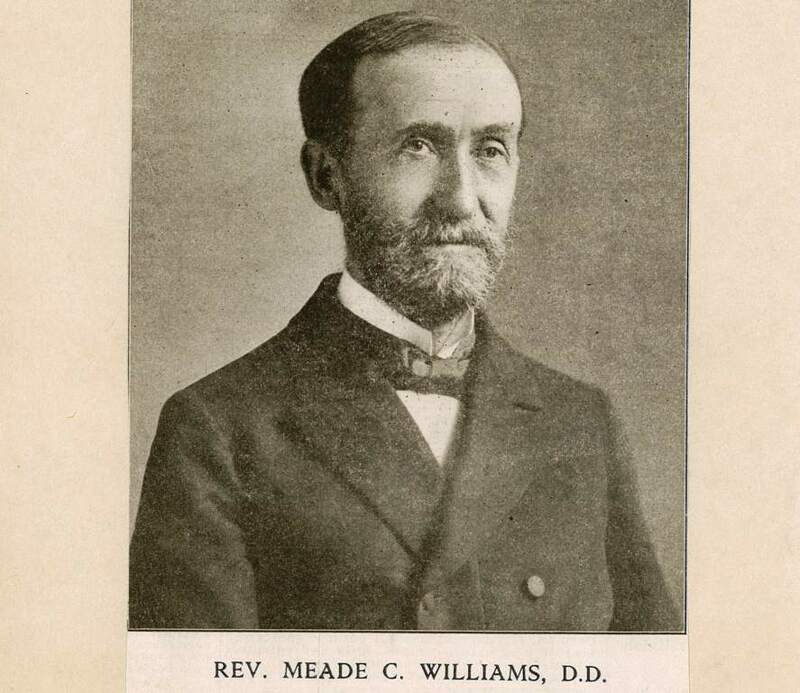 A co-editor of Cincinnati's Herald and Presbyter, Williams opposed the committee's work. From RG 414, Meade C. Williams. The editorial also raised several thorny questions. What, constitutionally, is the force of “approval” by the General Assembly? While the current text is proposed for voluntary use, if this text is the only “approved” text, will it not eventually become the norm by which all practices will be judged? How then is this still voluntary? Will this not also make it a standard for Presbyterian worship, and—if a standard alongside the Westminster Standards—has not the constitution been amended without the approval of the presbyteries? How can this be legal? The editorial concluded that the whole project should be abandoned. No stranger to the methods of church advocacy, van Dyke took to the church-related press across the country to defend the committee’s book and the voluntary use of liturgies in Reformed churches. During April and May of 1906, in article after article in the New York Observer, Chicago’s The Interior, and other papers, he made the same case that he had already made successfully to two General Assemblies: (1) the current state of Presbyterian worship is so fragmented as to be almost chaotic, (2) the question is not forms vs. no forms, but good forms vs. bad forms, (3) the proposed book was produced by and for Presbyterians using methods approved by two General Assemblies, and (4) any opposition to a voluntary book can only come from alarmists and people being stampeded by unscrupulous zealots. Since 1906, the Presbyterian Church has always had a denominationally related service book, and for this reason alone the publication of The Book of Common Worship was a significant milestone in the reshaping of modern Presbyterian worship. The text was revised in 1932—the last edition in which van Dyke had a personal hand. The copyright was lodged with the Board of Publications, and in 1941 it was finally designated an official publication of the PCUSA. Thereafter, a permanent committee of the General Assembly saw to its continued revisions. Through its many iterations—The Book of Common Worship (1946), the Worshipbook (1970), and The Book of Common Worship (1993) —the basic structure of the book has not changed, and this may be the secret of its longevity. It has always offered form and freedom: several alternative forms for worship, a treasury of prayers, and versions of the psalms adapted to use in Christian worship. Frontispiece of final version. From West Press Collection, Number 1522. From the perspective of more than a century, “van Dyke’s prayer book” was a manual of practical Reformed theology written with a deep pedagogical purpose. In continuity with Benson’s Hymnal  (1895) and van Dyke’s own “Brief Statement of the Reformed Faith” (1902), the 1906 Book of Common Worship created a normative standard for worship toward which the church could move voluntarily without coercion and without schism—reformation without revolution. The 1946 edition was the first to drop “For Voluntary Use” from the title page. The greatest fear of the book’s opponents—that its use would be required—had not come true and the statement was deemed unnecessary. The book has won an enduring place in the church’s life though its usefulness, beauty, and flexibility. It did not need to be adopted or recommended, required or imposed. It simply commended itself. 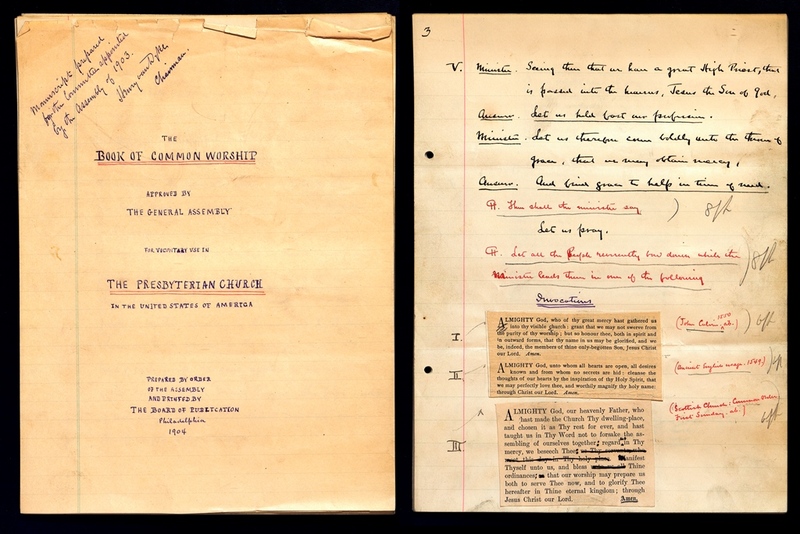 The “Records of the Special Committee on Forms and Services” are in the collections of the Presbyterian Historical Society, Record Group 65  (0.25 cu. ft.). It includes meeting minutes, manuscript drafts of services and prayers, correspondence, published reports, contemporary newspaper and journal clippings, tabulations of the 1904 survey results, and earlier Church Service Society materials. The preface to The Book of Common Worship (1993)  includes a brief survey of previous books before listing the permanent gains all of them have made to the theological reflection and worship work of the Presbyterian churches. American Presbyterians: Journal of Presbyterian History 71:3 (Fall, 1993) covers historic Presbyterian worship from all angles in celebration of the publication of The Book of Common Worship (1993). For information about ordering the Journal, click here . The most complete monograph on the subject remains Julius Melton, Presbyterian Worship in America: Changing Patterns Since 1787  (1967).